The Boston Bruins dropped their second consecutive matinee game to the Pittsburgh Penguins, 5-2 in the Steel City thanks to some porous first-period defense (three goals allowed) and the losses of four players for all or part of the game due to injury. The Penguins won their ninth consecutive game getting three points from Evgeni Malkin and James Neal on the afternoon. Three first-period goals-allowed chased the reigning Conn Smythe and Vezina-winner, Tim Thomas, after the first period. The first was a bit of a fluke – as Ben Lovejoy’s shot from the point got partially blocked by Shawn Thornton, making it more like a perfect doorstep pass to Arron Asham on Thomas’ doorstep and the gritty forward slipped it through the netminder’s wickets for an early lead. Bad net-front coverage was at fault here. The second goal, via defensemen Matt Niskanen was the result of more poor net-front coverage as James Neal was able to set up the screen right in the B’s goaltender’s line-of-sight. Some suggested a deflection was partly to blame – either way, the B’s needed to be surer clearing the area around the crease. Adam McQuaid was injured attempting a hit on Neal earlier in the play – so all-in-all it the antithesis of a successful shift for the Black and Gold. The final goal allowed by Thomas found its way to the five-hole again. Following a successful zone-clear by the B’s during the first five-on-three they faced in the frame, Evgeni Malkin (more on him later) entered the zone and threaded a beautiful cross-ice pass to James Neal who made no mistake for his thirty-first of the year. While it’s hard to fault a team for giving one up when down multiple players, the usually-defensively-studly combo of Patrice Bergeron and Dennis Seidenberg allowed Neal to streak in unabated back-door for a walk-in opportunity. The Penguins fiercely pressured the Bruins throughout the initial frame, with tremendous hitting and aggressive forechecking. The B’s upped the defensive ante down McQuaid in the periods that followed, but you’re not going to win too many games when you allow three unanswered in the first. The Penguins’ Hart Trophy-candidate, Evgeni Malkin was in the action from start to finish. Offensively, he was outstanding: Malkin added three assists (38-46-84 in 61 games) to his totals to regain the scoring lead (at least temporarily) over Steven Stamkos. One of those assists was his five-hundredth career point, standing as one of the fastest active player to reach that impressive milestone – in just 413 games and at the young age of 25. A commendable accomplishment for one of the game’s true stars. Of course, there were negatives, too. After assisting on the Penguin’s late-first-period powerplay tally, Malkin showed off the talents that may earn him a spot on Russia’s Olympic Springboard Team, falling to the ice to draw a call with 25 seconds to go in the frame. Additionally, Malkin received a (somewhat surprising) two-minute minor penalty for boarding when he sent Johnny Boychuk face-first into the Consol Energy Center’s end-boards with a hit to the Bruin defenseman’s numbers. Some thought that the hit deserved of a five-minute major, and others opined that the Hart-candidate will be receiving a phone call from NHL-disciplinarian, Brendan Shanahan… don’t hold your breath. Patrice Bergeron – The biggest potential loss is Bergeron, who took a shot off of his foot/lower leg during a penalty kill in the second period. He stayed on his skates until the clear then was off to the locker room in obvious discomfort. Bergy tried to come back later but just couldn’t fight through it; he left the ice for good in the third. Bergeron has arguably been the Bruins’ MVP this season and with so many other key players disabled, this could be a back-breaker. Adam McQuaid – As mentioned earlier, McQuaid was injured during an attempted hit on the Pens’ Neal right before their second goal. Immediately following the collision McQuaid was hunched over in pain, trying to stay on his skates and eventually had to be helped off the ice. 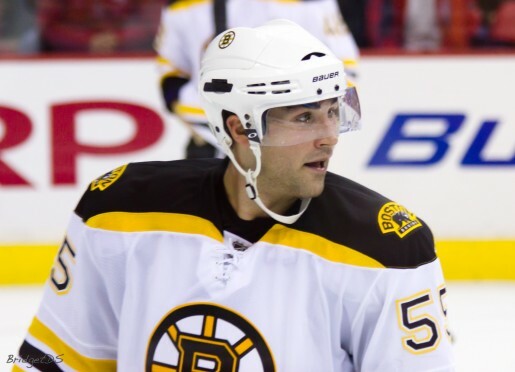 ‘Darth Quaider’ is a key element of the Bruins’ ‘team toughness’ and brings steady defending to the bottom-pairing. 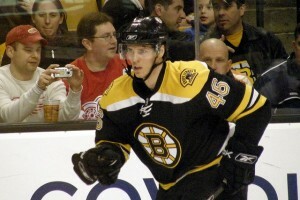 The B’s have Greg Zanon and Mike Mottau to step in but it’ll be hard to replace the 6’4 McQuaid. Max Sauve – What a tough way to end your NHL debut. Sauve, one of the B’s more talented prospects (super-fast skater with good hands), left his first game with the big club after seven shifts, 3:43 of ice time and zero shots-on-goal. Sauve has had numerous durability issues which have hampered his development – today’s result was not what we were looking for. Veteran netminder, Marty Turco – whose season to date consisted of ten games in the Austrian Erste Bank Eishockey Liga looked decent in two periods of play in relief of Thomas. Stopping 20 of 22 shots, the former Chicago Blackhawk and Dallas Star made a few clutch saves (and one spectacular pinwheeling save) that gave the B’s a chance late. It’s unknown how many starts he’ll receive, but Turco showed today that he’s still got something left in the tank which is good news for Boston with Tuukka out and Tim Thomas struggling a bit. David Krejci hit twenty goals for just the second time in his career with two on the afternoon. It’s been three seasons since the Czech center reached that plateau which he initially attained in his breakout 2008-09 campaign. Krejci also grabbed his fiftieth point on the year – making it four straight seasons he’s hit the half-century mark in scoring. Centering a line of Milan Lucic and Tyler Seguin, Krejci and Co. were consistently the most dynamic bunch for the Bruins this afternoon. Each of the three played in excess of 21 minutes (a rarity for Bruins’ forwards) with the B’s shortened bench. Both Seguin and Lucic added two assists in the game and each member of the trio has seven points since the start of March.